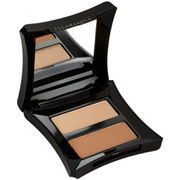 Accentuate your facial features with Illamasqua's Bronzing Kit; a professional cheek brush and two shades of face powder that will lend your complexion a defined, chiselled appearance. Combining a neutral matte shade for sharp definition, and a shimmering champagne highlighter to illuminate your favourite features, the blendable, buildable powder can be used dry for a natural finish, or wet for more intense colour. 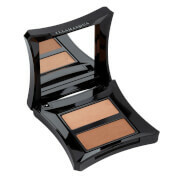 Housed in a mirrored compact for easy application on-the-go. Suits all skin tones. An angled contouring brush fitted with soft, synthetic bristles that perfectly fit the contours of your face. Perfect for applying cream and liquid foundations, or for defining facial contours with blush and bronzer, the makeup brush enables you to enliven natural features or completely modify your face shape with a professional finish. Powder: Sweep 'Heliopolis' along cheeks to define, then dust 'Lumos' to highlight. Use dry or wet for a bolder colour pay-off. Can also be used as an eyeshadow. Brush: Simply apply contouring shade to your forehead, under cheekbone and along jawline, then buff in a circular motion for a naturally, diffused finish. Heliopolis: Talc, Boron Nitride, Zinc Stearate, Ethylhexyl Palmitate, Trimethylsiloxysilicate, Dimethicone, Aqua (Water, Eau), Sodium Benzoate, Potassium Sorbate, Titanium Dioxide (Ci 77891), Iron Oxides (Ci 77491, Ci 77492, Ci 77499). Lumos: Talc, Dimethylimidazolidinone Rice Starch, Mica, Aqua (Water, Eau), Magnesium Myristate, Propylene Glycol, Octyldodecanol, Isopropyl Myristate, Glyceryl Stearate, Phenoxyethanol, Peg-150, Ricinus Communis (Castor) Seed Oil, Cetearyl Alcohol, Silica, Quaternium-26, Methylparaben, Glyceryl Ricinoleate, Cera Carnauba (Copernicia Cerifera (Carnauba) Wax, Cire De Carnauba), Candelilla Cera (Euphorbia Cerifera (Candelilla) Wax, Cire De Candelilla), Ethylparaben, Sodium Cetearyl Sulfate, Stearic Acid, Cera Microcristallina (Microcrystalline Wax, Cire Microcristalline), Propylparaben, Tetrahydroxypropyl Ethylenediamine, Paraffinum Liquidum (Mineral Oil, Huile Minérale), Cetyl Alcohol, Cera Alba (Beeswax, Cire D’abeille), Parfum (Fragrance), Mica, Calcium Aluminum Borosilicate, Silica, Tin Oxide [+/- May Contain / Peut Contenir: Titanium Dioxide (Ci 77891), Iron Oxides (Ci 77491, Ci 77492), Carmine (Ci 75470)].